We're into the third week of Detox January and I'm finding it easier this year than last. Not sure why, as it's more challenging this year, given that this blog gave me the Freshman Fifteen last year. But, as always, breakfasts are challenging. If you've been following along on my special Detox January Pinterest board, you'll know what I mean. Skinny cookies? Lots of ideas. Healthy dinners? Can't cook through them fast enough. Light breakfasts? Then I stumbled across overnight oatmeal. Warning: this is not that overnight oatmeal made in cute Mason jars in your refrigerator that is all over Pinterest right now like a bad rash. Maybe I'm inept, but I've tried to do that twice, using two different recipes, and it turned out like ... well, let's just say I wouldn't feed it to my dogs, even though they eat oatmeal every morning for breakfast. The original recipe (from Eating Well) that I started with called for the usual mix-it-all-up-and-turn-it-on crockpot method. I know from both personal experience and comments from my Facebook followers that this method often leaves you with scorched edges and a big ol' mess to clean up in your crockpot. No thanks, I've got enough freakin' cleaning to do every week without adding baked-on crockpot goo. 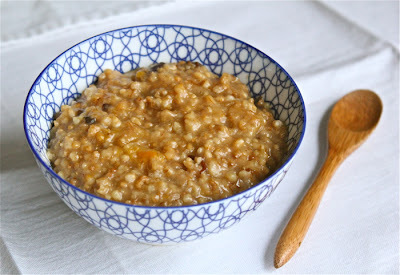 But, lo and behold, buried in the comments section of the recipe was one reader's incredibly valuable two cents: in brief, she suggested using the crockpot as a slow-cooking water bath for the oatmeal. Here's how it works. Simply combine steel-cut oats with water, salt and whatever dried fruit you like in an oven-safe bowl (I used a 4-cup Pyrex measuring cup). Put the bowl inside the crockpot and fill the crockpot around the bowl water until the water level is above the level of the ingredients in the interior bowl without spilling over into the bowl. Cover, turn on low and let it cook while you enjoy restful slumber (anywhere from 7-10 hours has worked fine for me). In the morning, breakfast is served: you're just like Lady Edith Crawley on Downtown Abbey (but without the back-stabbing bitchy side)! Although I don't expect you to dress for breakfast. Do you make overnight oatmeal? What are your favorite methods and ingredients? The Ninj wants to know. Note: This makes anywhere from 2-4 servings, depending on how much oatmeal you like in the morning. It can easily be doubled to feed a crowd, as long as your crockpot is big enough. Combine the oats, water, salt and fruit in an oven-save bowl that can fit inside your crockpot. Place the bowl in the crockpot and fill the crock (NOT the bowl) with enough water so that the water level rises above the water line of the interior bowl. Put the cover on and turn the crockpot on low. It can cook for between 7-10 hours with no worries about scorching the oatmeal. Serve with a drizzle (or two) of maple syrup or honey to taste. I make mine in my rice cooker on the porridge setting. Perfect everytime. That's a super idea! I love steel-cut oatmeal but never had time to make it. Yay--I love having a HOT breakfast. Definitely let me know if you give it a try! Brilliant! I love some oatmeal but sometimes it's hard to find time to make it as I rush around in my morning frenzy. Problem solved. Thanks! Thanks, Andrea -- let me know if you enjoy it. I make mine with almond milk instead of water& use honey and cut up apples and pears with lots of cinnamon& use couple tbsp coconut oil.i make mine in just a crock lightly oiled for about 6-8hrs and its comes out easy.then i just freeze some induvidual portions and micro them as needed.it freezes very well!